Hope you had a good Easter long weekend! I spent mine bouncing between Ottawa and Montreal, doing some jamming/recording and hanging with pals in both cities. The absolute highlight of the weekend was going into one of my favourite yarn stores in Ottawa and finding three (!!!) cute pups hanging out in the shop, all of whom wanted treats & head-scratches. The one pictured above was named Charlie and apparently he pesters all of the customers for attention non-stop. I melted from cuteness. We’re thrilled to welcome local musician Kyle Jukka into the pilot seat for the April edition of If You Got Ears. During his residency, he’ll be sharing a collection of music that has a strong transportive affect, impressionistic intention and sense of inventiveness: music from different places and time periods that points towards the building of our relationship with our senses. From the mysteriously hypnotic rhythms of indigenous Tanzania to the sparkling flavors of Latin America to the popular music of the USA and UK, the focus will be on music that paints pictures of worlds and transports you into them. Tune in every Wednesday from 12-2pm, or download the audio from our archives. 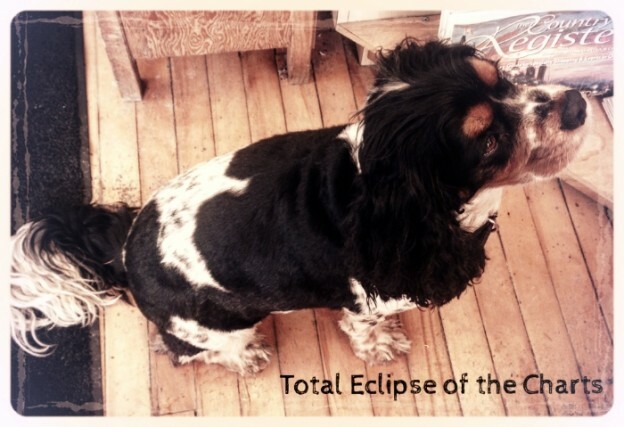 This entry was posted in Charts and tagged If You Got Ears, kyle jukka, puppies, specialty charts, top 30, total eclipse of the charts on March 30, 2016 by CKUT Music Coordinator.